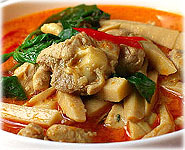 For Thai food, rice is the staple diet. It produces carbohydrate as energy giving for the body. 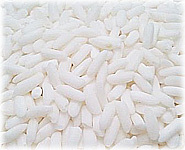 Rice also contains many vitamins and minerals. Rice comes in many different forms. There is long and short grain rice and the color is also different. It can be white, brown, red or black in color. 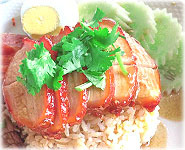 Plain rice is eaten mostly in the central and southern Thailand. 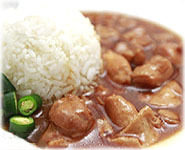 The glutinous or "sticky" rice is popular in the north and north-east of Thailand. 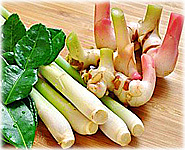 However, sticky rice is also used mainly for snacks and sweets in Thaifood. PLAIN RICE (LONG GRAIN) : To cook plain rice, for every single measure of rice you put two measures of water into a pan and bring the water to a boil. Boil the water until the rice is soft on the outside but still hard in the center for about 10-15 minutes. The time will vary depending on how much rice is being cooked. Put the lid on the pan, turn the heat right down and let the rice cook until the water has evaporated for about 5-10 minutes. If the rice on the top is cooked, then all the rice in the pan will be cooked as well. Once all the water has evaporated care must be taken not to burn the rice at the bottom of the pan. STICKY or GLUTINOUS RICE (SHORT GRAIN) : Sticky rice is a different grain of rice from plain rice and it is eaten mainly in the north and north-east of Thailand. The sticky rice needs to be soaked in water for at least 3 hours and overnight before it is cooked. Drain the water out of the sticky rice into the top part of a steamer. If the steamer has big holes in it, then put a muslin cloth in the steamer first, to stop the rice falling through the holes. Then bring the water in the bottom part of the steamer to the boil. Once the water is boiling, it will start to cook the rice. When you can see steam coming through the sticky rice then put the lid on the steamer for 5 minutes. Check the rice and if it is not hard in the middle it is cooked. If the middle of the rice is still hard then you need to replace the lid another few minutes. Once it is cooked turn the heat off and put the sticky rice onto a tray or plate. Use a spoon to move the rice around to get rid of all the hot steam. If you do not do this, the sticky rice will go soggy. The sticky rice is then ready to be eaten. It can also be kept to eat later in the day.